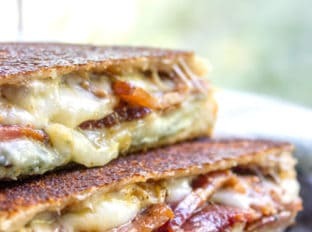 Fig and Bacon Grilled Cheese, otherwise known as The Figgy Piggy is a grilled cheese sandwich with homemade fig spread, bleu cheese, provolone and thick cut bacon. 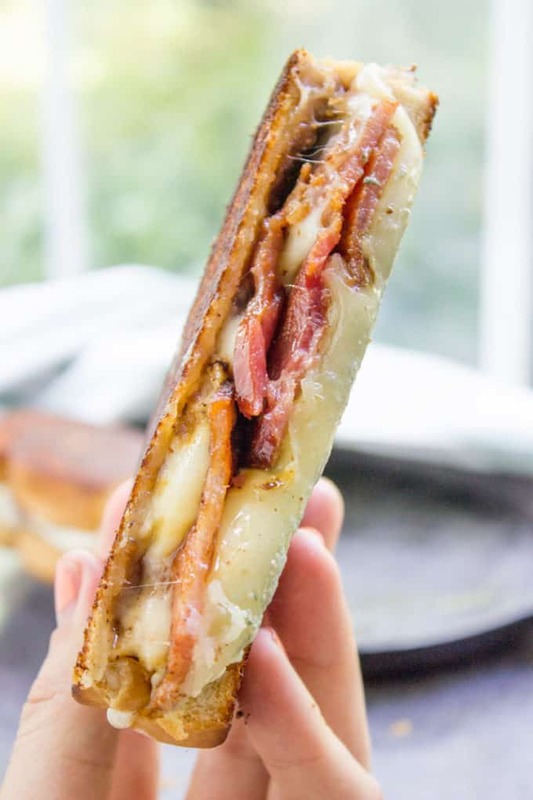 Fig and Bacon Grilled Cheese is a play on one of my favorite pizzas back home. The same restaurant that makes the legendary Brussels Sprouts makes the most amazing “Figgy Piggy” pizza. 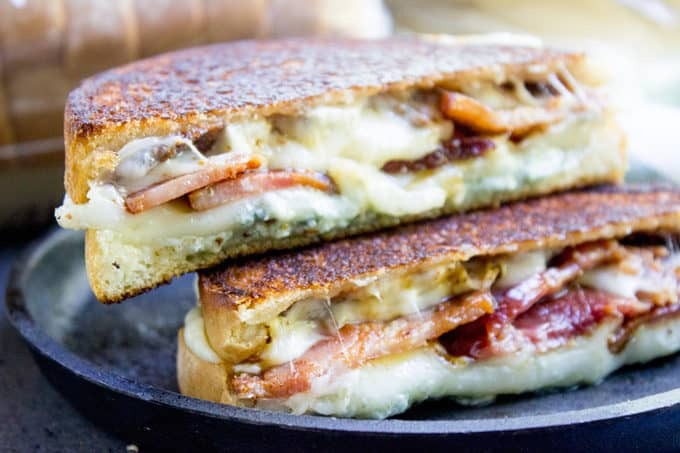 The thick slices of bread are a perfect fit for your favorite grilled cheese and the mild flavor doesn’t overpower the amazing filling of homemade fig puree, bacon, bleu cheese and provolone cheese. 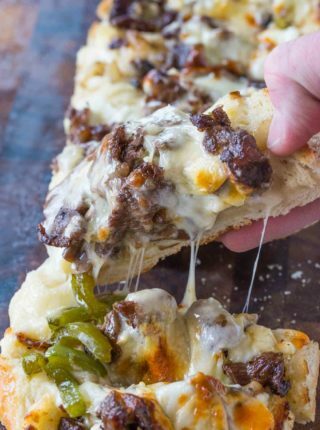 The hearty Italian style bread will hold strong under the weight of the gooey cheese, but won’t overpower your fillings. It also crisps nicely on the outside, while the inside remains soft and fluffy for when you dig in. Have you ever seen a more beautiful cutting board? 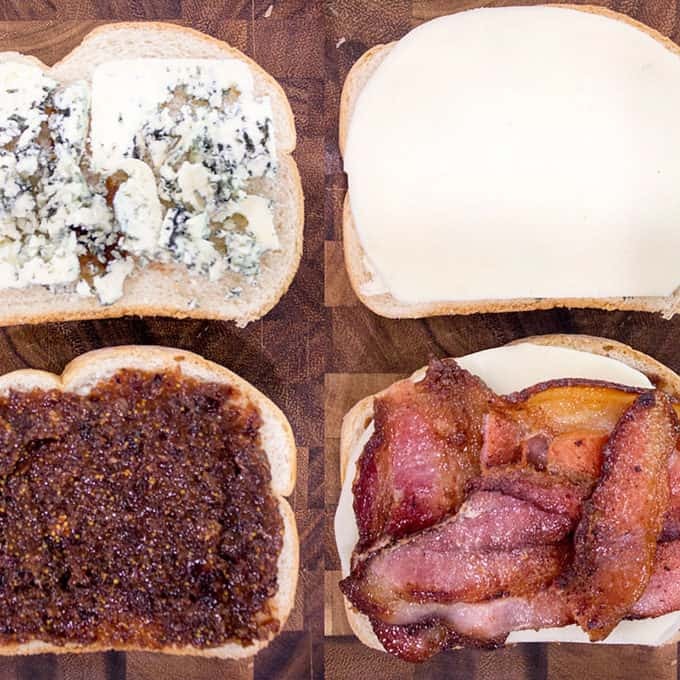 Bleu cheese, bacon, fig puree? This grilled cheese is the perfect way to kick up the grilled cheese to a whole other level. 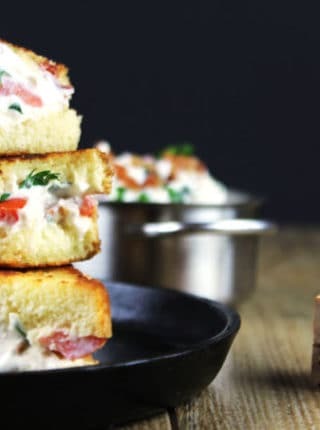 You don’t need too much bleu cheese, if you use too much it is going to completely overpower your sandwich and the fig needs a little help standing out. The bacon on the other hand? Go all out. 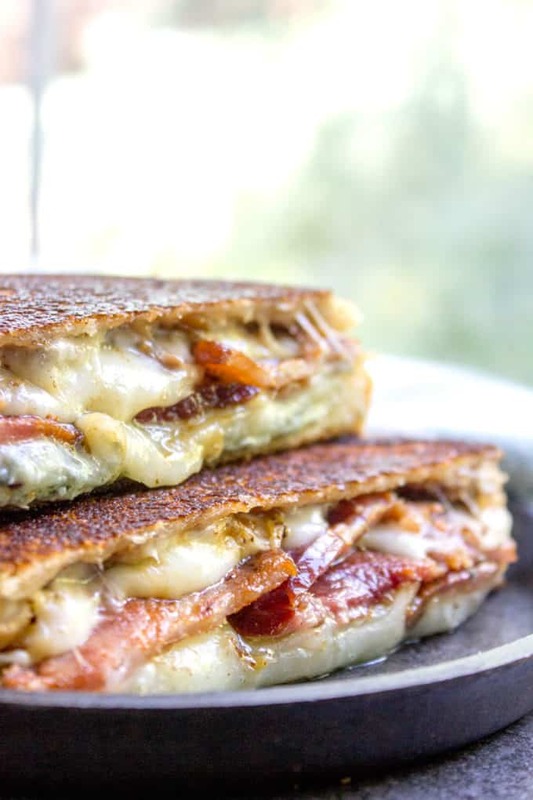 Thick sliced bacon crisped up makes for a great meaty bite in this grilled cheese. The provolone is on both sides to help seal in the fig puree and the bleu cheese. It is also a fantastic melting cheese so you’ll have that delicious stretchy cheese moment when you take your first bite. Add the figs to the water and either let sit overnight or microwave for 2-3 minutes. Remove the figs and add them to a small food processor and add water as needed (I used 2 tablespoons) to make a spreadable puree. You can add sugar to the puree if you would like but with this savory grilled cheese I didn't. 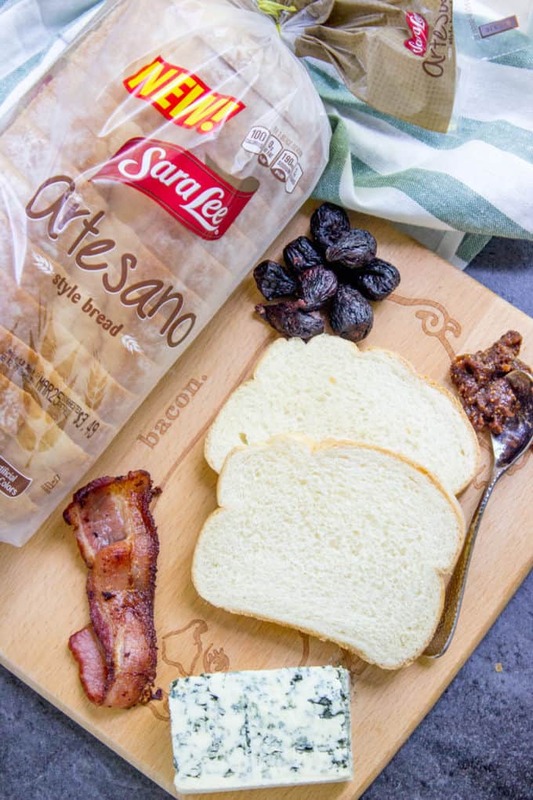 Spread the butter on one side of each of the 8 slices of Sara Lee® Artesano™ Bread. Butter side down on the cutting board add fig puree to four of the slices. Add the bleu cheese to the remaining four slices. Add a slice of provolone to each of the slices. Top four slices with bacon. Close the sandwiches, a bacon covered piece of Sara Lee® Artesano™ Bread with a non bacon covered piece. In a cast iron pan or griddle on medium high add the sandwiches and cook for 3-5 minutes on each side. Would it be okay to use fresh figs instead of dried? Sure, fresh figs will have a higher water content though, so I would just keep that in mind as they cook, they may release some liquids. This looks so good!! I’ve never cooked with figs before but I’ve got to try this recipe. And with bacon. Oh my!! Fig and bacon is an excellent combination! I’m having a visceral reaction to this grilled cheese! OhMaGawd! I can’t get over all the flavors in this grilled cheese! Love that you used blue cheese! I totally love grilled cheeses that go beyond the norm! This sandwich looks amazing! This sounds SO amazing! I love it! They really do go amazingly well together! Fig and bacon – oh heck yes! 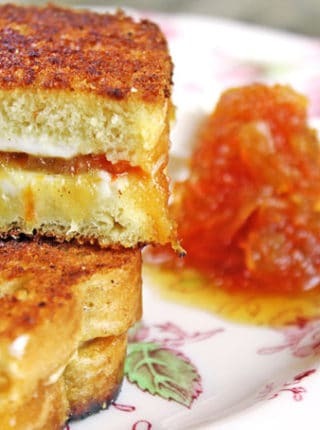 LOVE this concept for a grilled cheese….yum! It really is one of the best grilled cheese sandwiches I’ve ever had! “Figgy Piggy” — how cute! I love the addition of blue cheese in this delightful sandwich. Good bread is so important in a sandwich, and this Sara Lee bread looks perfect! Thanks! If you’re going to make a grilled cheese, it all starts with the bread! Awww, thanks! I am to please! Insanity!!! 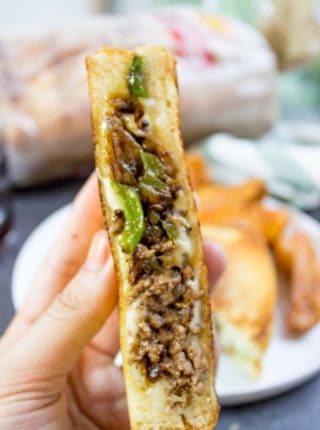 There are no words for how much I NEED one of these sandwiches right now! They look and sound incredible! What a flavor combination. It really is as delicious as it looks! I love when the crunchy outside is filled with creamy cheese! The best part of grilled cheese is the stretch! Fig and blue cheese is a great combination! OMG! This looks so good!